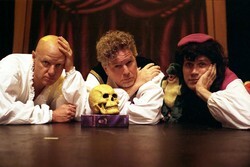 The Reduced Shakespeare Company will present "The Complete Works of William Shakespeare (abridged) [revised]" at 7:30 p.m. Tuesday, Sept. 11, in W.M. Turner Auditorium on the SFA campus as part of the College of Fine Arts' University Series. NACOGDOCHES, Texas - The College of Fine Arts at Stephen F. Austin State University will open its 2018-19 University Series with a hilarious performance of the Reduced Shakespeare Company in "The Complete Works of William Shakespeare (abridged) [revised]." This riotous romp through each of the Bard's plays is at 7:30 p.m. Tuesday, Sept. 11, in W.M. Turner Auditorium on the SFA campus. The show features Reduced Shakespeare's madcap men in tights as they weave their wicked way through all 37 of Shakespeare's plays in one 97-minute wild and memorable ride. The show has left audiences from Los Angeles to London helpless with laughter, according to Scott Shattuck, associate dean of the College of Fine Arts and director of the University Series. "As a host of "The Today Show" said, 'if you like Shakespeare, you'll like this show; if you hate Shakespeare, you'll love this show,'" Shattuck said. "Anyone that has ever slogged through hours of reading to finish a Shakespeare play for school will get joyful revenge in their laughter at this irreverent performance. But Shakespeare fans will not be disappointed either," he added. Written by Adam Long, Daniel Singer and Jess Winfield, with additional material by Reed Martin, and directed by Martin and Austin Tichenor, the play became London's longest-running comedy and also enjoyed a successful New York run. The Nacogdoches performance is the first stop on a national tour that will take the RSC from California to Massachusetts, with several other major universities, including UT-Austin and Texas Tech, along the way. Prior to the performance, Dr. Elizabeth Tasker Davis, associate professor and coordinator of graduate studies in SFA's Department of English and Creative Writing, will present an informative talk on "Shakespeare's Women" at 7 p.m. in Griffith Gallery. The gallery is located across the hall from Turner Auditorium, which is inside the Griffith Fine Arts Building, 2222 Alumni Drive. The audience is invited back to the gallery for a post-performance reception to meet the company's performers. Other upcoming University Series performances include the dynamic new SYBARITE5 string ensemble on Oct. 18; the widely popular Dailey & Vincent bluegrass duo presenting "A Springer Mountain Farms Christmas" on Dec. 11; the high-energy dance ensemble Step Afrika! on Jan. 25; and the contemporary Mexican music trio the Villalobos Brothers on May 9. Two special Encore Events this year will include "An Evening with Branford Marsalis" on Oct. 10 and The Purple Xperience, a Prince tribute, on Nov. 30. Encore Event tickets are $45 for Section A seating; $36 for Section B seating; and $27 for Section C seating. Discounts are available for seniors, students, children and SFA faculty and staff members.